Introducing FEED + KK intl. Home / Blog / Introducing FEED + KK intl. We are thrilled to announce a special partnership today, which has been a long time in the making. This holiday season, we’ve teamed up with our fellow changemakers at Krochet Kids intl. to offer a collection of cozy hats that are sure to warm both heads and hearts. 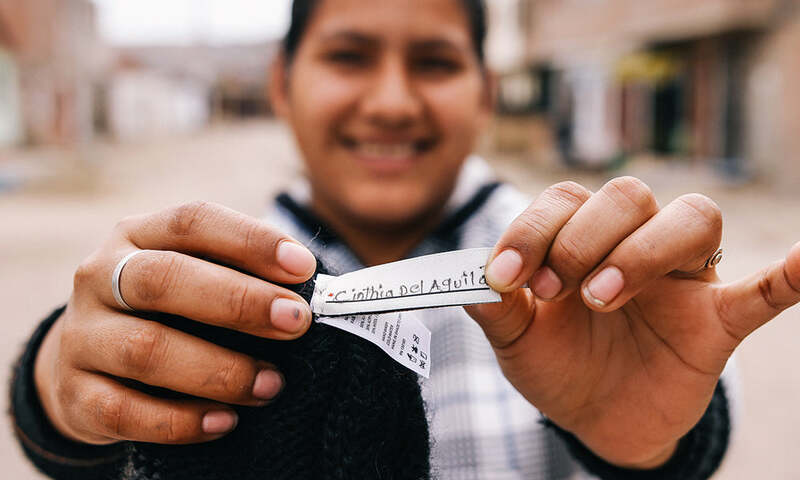 Each hat from the new FEED + KK Collection is loomed and sewn with locally sourced yarn by a woman in Lima, Peru, and features the signature of the woman who made it. True to the FEED model, each hat also provides 10 school meals to children in need. We love KK Intl. for its founding mission to focus on providing empowerment, rather than short-term aid. Eight years in, the organization now employs over 200 women in Uganda and Peru, while also offering programs that help these women create and thrive in their own businesses. Equally as inspiring as the brand’s mission is its founding story, which began with some fearless college kids from the west coast who found a way to transform Northern Uganda by hook and yarn. Curious to learn more about this incredible partner of ours? Read on for Lauren’s exclusive Q&A with KK intl. co-founder Kohl Crecelius. FEED and KK intl. have a lot in common as brands that use fashion to incentivize people to be part of the change needed in the world. In your own words, what was the founding vision of KK intl. and how, if at all, has that evolved over the years? First things first, I have to say how excited I am that we are working together on this collaboration. I am a big fan of LBL and the entire FEED team. You all definitely inspire me. Ok, now to answer your question… We at KK intl. exist to empower people to rise above poverty. We provide jobs, education, and mentorship to women in Uganda and Peru. Every product we produce is made and hand-signed by these very women so customers can come to learn their story. Little has changed this vision, but having worked to accomplish our mission for over 8 years, we are a lot more effective at what we do. We measure the social impact we generate for the women we serve and their families on a monthly basis. We are seeing communities transformed by helping local leaders rise up. For someone who is just learning about Krochet Kids, how does your model work? We provide holistic development to the women who participate in our programs. The ultimate goal is to equip them with the tools, skills, and resources they need to care for themselves and their families completely on their own. That starts with consistent employment through the production of all our goods and is then coupled with a 3-year education curriculum and one-on-one mentorship facilitated by our local staff. They graduate from our programs into careers and businesses they have started. Tell us about your name. What's the significance of the intl.? The first part of our name — “Krochet Kids” — stemmed from the first company I ever started. While in high school, my older brother taught me how to crochet and some friends and I started a custom beanie business, selling hats to friends in the Pacific Northwest. As we began having opportunities to travel internationally, we came to understand how this simple craft could translate into a job for others in developing countries. We filed as a non-profit organization under the name Krochet Kids intl. and the name has been with us ever since. You will start to see us using KK intl. but you all will know the true origins! Take us behind the brand of KK intl. What does a typical day at your HQ look like? As you are well aware, “typical” isn’t an adjective that describes a day at the HQ. For starters, I spent the last 3 days scanning products into boxes for all our fall retail shipments. Oh the glamorous life of a social entrepreneur! All in all, a normal day involves meetings to discuss our marketing strategies, a solid number of emails & phone calls, with a photo shoot likely taking place. My husband, David, and I are about to have our first baby. And I know you just celebrated the birth of your son, Clive. It's exciting to think that our children will grow up in a world where conscious consumerism is the norm. What is your hope for the next generation? I can’t express how excited I am for you two! There’s truly nothing like it. I have many hopes for the next generation, and this topic has taken on a whole new meaning with the addition of a family member who happens to be of the next generation. When it comes to consumerism, I hope this generation comes to not only expect products and brands to have a social mission fully integrated into their business model, but I also hope they come to place importance on understanding the actual outcomes taking place as a result of social good programs. An educated consumer base can continue to shift culture and force companies to continue to improve their social impact programs. This is FEED’s first introduction to selling hats. Can you tell us a bit about how this hat is produced and how we arrived at the color ways that are distinct to FEED in this collection? These hats are made by the lovely women who work at our empowerment project in Lima, Peru, and the yarn is sourced locally as well. Panels are individually and skillfully produced on one of our hand-powered looming machines and then hand-sewn to completion. Most importantly, each one has a label that features the signature of the woman who made it. The colors and tonal blocking was a collaborative process we went through together. My favorite part about collaborations is coming up with a product that truly represents both brands and in my (completely biased) opinion I think we #nailedit. You and the Krochet Kids team have accomplished so much and expanded your product offering immensely since your beginnings. What’s next for KK intl.? An experienced crocheter yourself, what’s one piece of advice you’d give to a novice like myself? I would tell you that if you want to make friends, crochet while you are traveling--especially on airplanes. People love it! On the inside of each and every KK intl. hat, you will find a tag with the signature of the woman who made it. The FEED + KK Collection is no expception, and we couldn't be more excited to read the names inside our own hats and celebrate the long term impact one purchase can have on a person's life. Can this be any cuter? (Answer: no.) 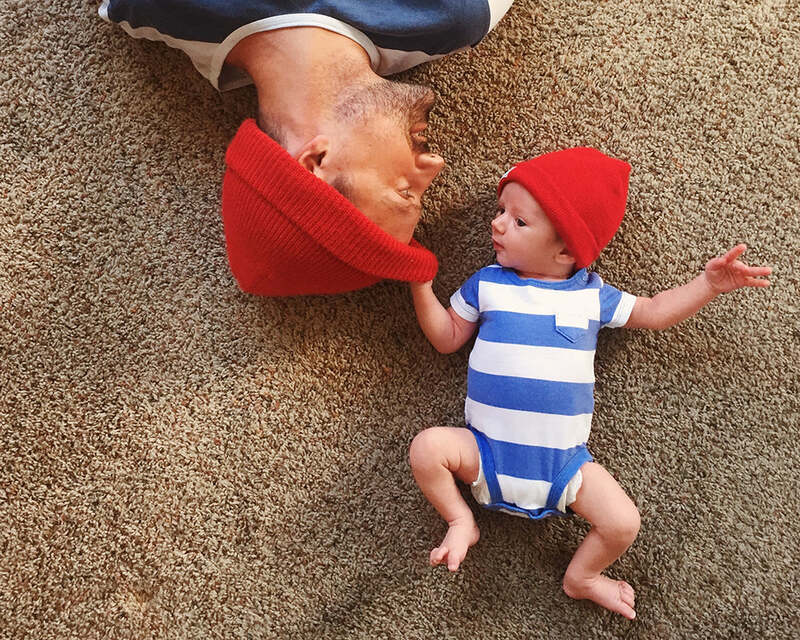 Kohl is already outfitting his new little boy, Clive, in mini KK hats. It's never to early to start making a difference, right? Holiday gifts anyone? Hurry, this is a limited-time partnership!